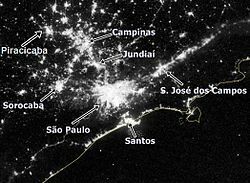 Greater São Paulo and Expanded Metropolitan Complex at night. Satellite imagery of the Expanded Metropolitan Complex at night. The macrometropolis and its divisions. The São Paulo Macrometropolis (Portuguese: Macrometrópole Paulista), also known as Expanded Metropolitan Complex is a Brazilian megalopolis that emerged through the existing process of conurbation between the São Paulo's metropolitan areas located around the Greater São Paulo, with more than 30 million inhabitants, or 74 percent of São Paulo State's population, is one of the most populous urban agglomerations in the world. Beyond the Greater São Paulo, the megalopolis encompasses the metropolitan areas of Campinas, Santos, Sorocaba and the Paraíba Valley, and other nearby cities, which include urban agglomerations in the conurbation process, as Jundiaí and Piracicaba. 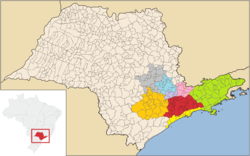 The total population of these areas added to the state capital exceeds 31.5 million inhabitants, or about 75% of the population of the entire state of São Paulo. The metropolitan complex is the only urban cluster (of agglomerations) of its kind in South America and covers an area of approximately 53 thousand square kilometers, connecting 174 municipalities and retains much of the industrial and economic output of the country. ^ a b "Macrometrópole Paulista". Emplasa. Retrieved 2016-08-31. ^ "Os eixos de desenvolvimento e a estruturação urbano-industrial do estado de São Paulo, Brasil". www.ub.es. Retrieved 2010-07-04. ^ Eugenio Fernandes Queiroga (May 2005). "A Megalópole do Sudeste Brasileiro: a formação de uma nova entidade urbana para além das noções de macro-metrópole e de complexo metropolitano expandido". Associação Nacional de Pós-Graduação e Pesquisa em Planejamento Urbano e Regional. Retrieved 2016-08-31. ^ "World Gazetteer – Welt: Ballungsräume". Retrieved 2008-08-10. ^ Secretaria de Planamento de São Paulo, ed. (2007). "CAPÍTULO II DESENVOLVIMENTO REGIONAL E METROPOLITANO" (PDF). Retrieved 2014-04-04. ^ "IBGE releases population estimates for municipalities in 2016". IBGE. 2016-08-30. Retrieved 2016-08-30. ^ "Estimativas populacionais para os municípios e para as Unidades da Federação brasileiros em 01.07.2016". IBGE. 2016-08-30. Retrieved 2016-08-30.